Last time when we discussed grammar we were focusing on the grammar shapes and symbols that students are introduced to in the Junior and Lower Elementary classrooms. This week we are going to check in with our Upper Elementary and see how they use and understand grammar while writing. In the Upper Elementary, one way students perfect their grammar skills is with sentence correction. Students are given cards with a paragraph on a famous artist. The entire paragraph is riddled with grammatical errors that the students have to correct. These errors include punctuation, capitalization and more. 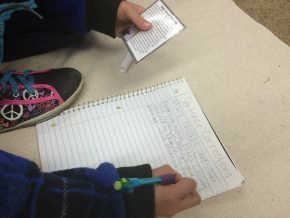 Students first hand write out the entire paragraph correctly, then they can check their work by finding the corrected version of the same card. This way students can learn from their mistakes. As an added bonus, students also learn about each person they are writing about. At the top right we have the card on Leonardo da Vinci with all the grammatical errors. Above we have the card on artist Andrew Wyeth. As you can see the left card is the one with all the errors and on the right is the corrected version. Below we have one of our Upper Elementary students working on correcting the card on artist Mary Cassatt. Grammar lays the foundation for effective communication and if one does not know their grammar the meaning and clarity of their message is easily misunderstood. Some errors are with sentence structure, subject/verb tense, spelling and other basic mechanics of written word. With grammer even something as simple as a misplaced comma can completely change a sentence. For example: “Let’s eat grandpa” vs “Let’s eat, grandpa.” Let’s not eat grandpa, shall we? From persuasive papers to resumes, grammatical errors immediately take away the intended strength necessary to acquire an ally on an issue or an invitation for a job interview. Grammar skills are needed and important to be an effective leader. Grammar rules are essential in everyday life for clarity of meaning and intent.